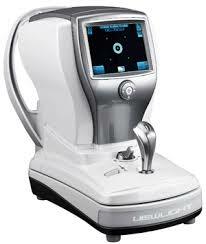 Battle Creek Eye Clinic is pleased to announce that it has added to it’s inventory of advanced eye health technology. With the Quantifeye MPOD Measurement Instrument our optometrists can assess your Macular Pigment Optical Density (MPOD)- a key risk factor for Age-related Macular Degeneration (AMD). AMD is the leading cause of severe vision loss and blindness in adults over the age of 55 and there is no cure for it. Its effects are gradual and irreversible which makes early detection essential. Once the early symptoms have been detected, steps can be taken to mitigate and slow the progress of the disease- and the Quanitfeye MPOD is one of the best instruments available today for doing this. Age-related Macular Degeneration (AMD) affects millions of people every year and the key to prolonging your vision is to detect it early and to mitigate the effects as effectively as possible. Battle Creek’s new Quantifeye MPOD is ready to serve you. Book an appointment today. 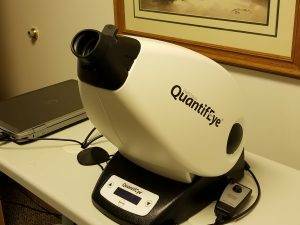 Our optometrists in Battle Creek, MI use cutting-edge digital imaging technology to assess your eyes. Many eye diseases, if detected at an early stage, can be treated successfully without total loss of vision. Your retinal Images will be stored electronically. This gives our eye doctor a permanent record of the condition and state of your retina. This is very important in assisting your eye doctors to detect and measure any changes to your retina each time you get your eyes examined, as many eye conditions, such as glaucoma, diabetic retinopathy and macular degeneration are diagnosed by detecting changes over time. Each eye is tested separately and the entire test takes 15-45 minutes. Our eye doctor in Battle Creek may ask only for a driving licence visual field test, which takes 5-10 minutes. If you have just asked for a driving test or the clinic doctor advised you have one, you will be informed of the result by the clinic doctor, in writing, in a few weeks. The Battle Creek Eye Clinic has acquired a new and highly sophisticated computerized instrument enabling us to provide detailed images from the back of your eyes. The OCT can assist us in early detection of Glaucoma, Macular Degeneration, Diabetes, and Optic Nerve Disease. Annual eye exams are vital to maintaining your vision and overall health. 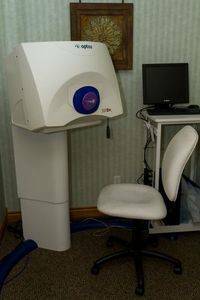 Our Battle Creek optometry clinic offers the optomap® Retinal Exam as an important part of our eye exams. The optomap® Retinal Exam produces an image that is as unique as you fingerprint and provides us with a wide view to look at the health of your retina. The retina is the part of your eye that captures the image of what you are looking at, similar to film in a camera. Please schedule your optomap® Retinal Exam at our optometry practice in Battle Creek, MI today! Also ask about Blephex, the most advanced treatment for blepharitis in eye care today!